HONG KONG, Jan 17, 2019 - (ACN Newswire) - Affluent Partners Holdings Limited and its subsidiaries (the "Group"; stock code: 1466), which are engaged in strategic investment and provision of financial services, has officially signed the cooperation agreement (the "Collaboration Agreement") with Equitativa Real Estate Limited ("Equitativa") with the partners committing to setting up a new real estate investment trust (REIT), namely the "Belt and Road REIT", to invest in property assets along the new Eurasia trade corridor of China's Belt & Road Initiative. Top executives from both groups namely Mr Stephen Yuen, Chairman of Affluent Partners Holdings Limited and Mr Sylvain Vieujot, Group Chairman of Equitativa attended the official signing ceremony at Equitativa's offices in Index Tower in Dubai on 15 January 2019, to witness the important moment of the launch of the initiative. Mr Stephen Yuen, Chairman of Affluent Partners Holdings Limited, said, "We are excited and honoured to have Equitativa, a leading regional asset management company, as our partner. We have great confidence in the prospects of this partnership as it will have powerful leverage from Equitativa, which boasts remarkable experience and a fantastic track record in setting up and managing REITs, including the Emirates REIT. The collaboration will entrench the good relationship between businesses in the United Arab Emirates and Asia and bring synergistic benefits to both partners." 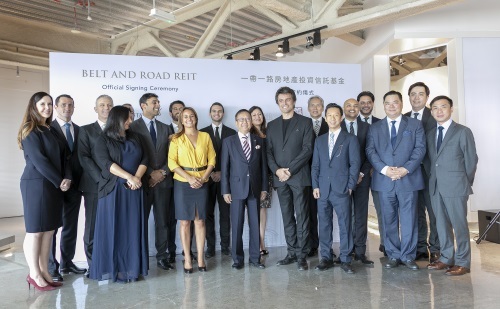 Mr Sylvain Vieujot, Group Chairman of Equitativa, said, "The collaboration with Affluent Partners and the establishment of the 'Belt and Road REIT' are an exciting experience for us and it marks a new chapter for Equitativa in Asia and emerging markets. We are confident that the Collaboration Agreement will benefit the increment of the fund raising capabilities in Asia and provides more opportunities to identify assets that can maximise the value for our shareholders." The Collaboration Agreement targets to create favourable investment opportunities for investors in emerging Eurasian markets by setting up one or more REITs. Affluent Partners will act as an advisor and work closely with Equitativa in establishing the new REIT. Going forward, the Group or its affiliates will be appointed as the manager and be responsible for the establishment and management of the REITs and facilitate the implementation of the REITs, referring clients for investment and identifying assets to seed the REITs. Representatives of Affluent Partners and Equitativa attended the Official Signing Ceremony held in Dubai.